Bedfont Lakes Country Park. Image: Google satellite. 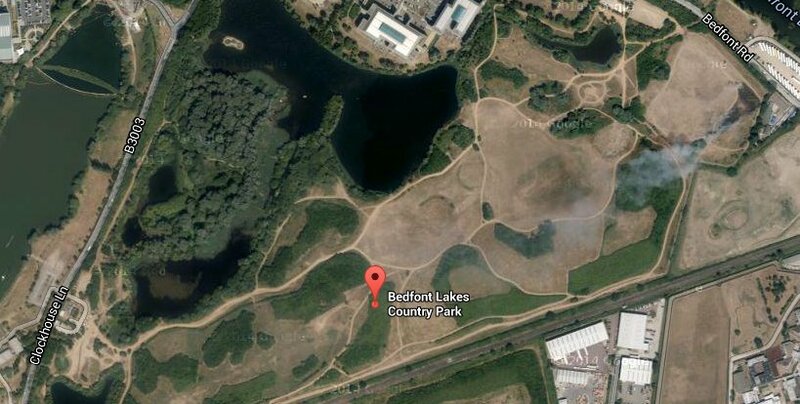 Police in Hounslow are appealing for information after two new-born lambs have been killed in Bedfont Lakes Country Park. They were beaten to death between 4.30 pm Friday, 10th April 7.30 am Saturday, 11th April. They were less than a day old. One was found dead in a tree. The second had to be euthanized by a vet due to the severity of its injuries. Other lambs were also injured in the attack but are expected to recover. All sheep in the field have since been removed from the park for their own safety. The first is described as a white, aged 16- 18, tall, chubby build, and had scruffy dark ginger hair which was gelled / swept forward. The second is also described as a white, aged 16 – 18, average height, slim build, short dark brown hair, thin face with an obvious gap between top two front teeth. And the third is also described as a white, aged 16 -18, slim build, short brown hair, no other details known. I am appealing for any information to this despicable act which has not only caused distress to the owner but also to members of public who use the park and see the sheep on a daily basis. I am also appealing to the three males to contact us, or anyone who recognises them from the descriptions to contact us, so we can speak to them regarding this incident. Anyone who recognises the three males or who has any information about the incident can contact PC Whitehouse at Feltham Police Station via 101. Anyone who wishes to remain anonymous can contact Crimestoppers on 0800 555 111 or via crimestoppers-uk.org.